This multi-cultural upbringing sparked in Patrizio an early passion for languages, and by the age of 17 he already spoke fluent Neapolitan, German, English, French and Spanish. It seemed obvious for Patrizio and his parents for him to become an interpreter, and after graduation from school he went on to study Roman and Slavic languages at University and that way he could add fluent Italian and Polish to his language tool kit. But whilst his aptitude for languages is admirable, a much greater gift, apparent even from the age of 4, was emerging – his gift to be able to sing and entertain people. While Patrizio’s parents would record old vinyl records onto cassettes to be played in their restaurant, the three or four year old Patrizio would sing along enthusiastically whilst playing with his toys. At the age of eight Patrizio received his first guitar which further encouraged his interest in entertaining his family and friends in the “Buanne home”. At the age of eleven, Patrizio had the first of his many appearances in talent contests. With the conviction at such an early age to, ultimately, become a singer and actor he ended up winning all the competitions he ever participated in. Several small musical productions and gigs, with his self-formed 50ies rock and roll band, and as a solo performer then followed. Six years later, when Patrizio was seventeen, a music industry manager who had heard Patrizio sing proposed a performance at the occasion of the “Papal visit” (John Paul II) in Wroclaw, Poland. The song, which was half in Italian, half in polish, had been written for the opening mass, and with 85.000 people in attendance Patrizio’s sudden popularity with the polish public led to his first local record deal. Tragically, it was also to be the year that his father died from virulent cancer, and the subsequent grief became such that Patrizio almost lost his own life to a perforated ulcer. “It was music and the goal to make my family proud that kept me alive and made me strong” Patrizio. At nineteen, Patrizio graduated from school in Vienna and moved back to Naples and later Rome, Italy for good….he thought. He attended a university to study languages, whilst looking out for opportunities in the entertainment industry. Patrizio quickly became popular through various talent competitions, and was requested to be a guest and entertainer on various Italian television shows such as “Momenti di Gloria”, “Domenica In” and “Libero”. This success lead to Patrizio being offered a contract to work as an entertainer for the production company that produced shows for the Italian Broadcasting Corporation, RAI and Mediaset. Patrizio’s real ambition, however, was to become an international recording artist, but he experienced that it would not have been easy to find a producer in Italy who saw the passion in recording with an orchestra comprising a collection of romantic and fun songs from the Italian songbook. –A repertoire from a different era, yet timeless and loved around the world. Noticing that people in the Italian industry found it ironic and simply didn’t want to understand the vision of a teenager, Patrizio sensed very soon that he would not be able to develop such career out from Italy. That way Patrizio from 1999 onwards invested his own money into shaping ideas and concepts with which to approach producers, record companies and concert promoters more in central Europe. Various trips and tours in central and eastern Europe, as well as independently produced and distributed CD’s and DVD’s were undertaken – all of which without having a manager. It took good 5 years, and in 2004 Patrizio was contacted by a producer who was interested in Patrizio’s concept, idea and voice and above all seemed to have the right financial resources to realize his passionate project and dream. The dream to record those very songs that Patrizio on one hand was brought up listening to and wanted to dedicate as a tribute to his late father, but on the other hand understood that Patrizio wanted to explain that Italian music is not just opera or classical, but that there are countless tunes that are originally Italian, and became international standards over the years. After starting to work and with an almost finished pre-produced album under his belt Patrizio was invited to audition for several record companies and was finally signed by a major record company in the UK (Universal Music) for a world wide release,…….still all of it without a manager!!! His international debut album entitled, “The Italian” , was finished at the Abbey Road Studios (made famous by The Beatles) in London, accompanied by the Royal Philharmonic Orchestra. After 18 months of detailed and hard work, it was first released on the 28th of February 2005 in the UK. It reached the top ten on the pop charts in the UK, where it attained golden status after selling 100.000 copies in only 1 week. Countless TV and radio interviews followed. Following international promotion, the album was released worldwide as an international priority by Universal music and certified first as Gold in some European countries (Austria, Finland) but more so also platinum in South Africa- as well as across Asia (Singapore, Hong Kong, Taiwan, Indonesia, Malaysia, Thailand) New Zealand, and even reached triple platinum status in Australia. In October 2006, Patrizio was invited by Dr. A. Kenneth Ciongoli, the chairman of the National Italian American Foundation, to perform at their prestigious annual gala in Washington, D.C. for the Italian American community where he was also introduced to the President of the United States. His live concert DVD which in the meantime certified platinum sales in Austral-Asia and which led into sell-out concerts in 2006 with a six week tour of major theatres and concert venues in Australia, Asia, South Africa and Europe was broadcasted on the American public television network PBS breaking records at PBS stations across the United States which lead to his first US tour playing venues with a capacity of 2000-3500 people across the nation. Patrizio’s second album 2007 “Forever Begins Tonight” (Universal music), in many ways a “volume 2 ” of his debut album, reached #53 in the US. The album included an Italian version of “Angels” (entitled “Un angelo”), which became Patrizio’s first radio hit in the United States. In less than two years, his debut album “The Italian” (2005) and “Forever begins tonight” (2007) had captured the hearts of fans, of timeless Italian songs, worldwide to the extent that over a 2 million albums were sold, and all this without Patrizio having a famous producer (such as David Foster), no international radio hit and still no professional music management behind Patrizio. 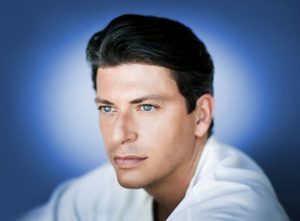 With this significant success under his belt and huge demand in the US by his fans, Patrizio decided that in order to take his career to the next level, he would need to spend time in the US not only touring, but to seek representation from some serious players within the music establishment. The company “MondoBuanne Productions” was founded. A group of people around the world that consult and coordinate for Patrizio’s concepts, ideas and projects. This next phase included securing a new PBS special and above all the recording of Patrizio’s 3rd album – this time in the US – (adding that way more strings to an already elegant bow), Under the helm of veteran music engineers/producers, Humberto Gatica (Celine Dion, Michael Jackson), a man who felt in love with Patrizio’s voice and understood as a man of latin decent Patrizio’s passion, and Brian Rawlings (Cher, Enrique Iglesias) who is responsible for countless hits in the last 20years, and recognized Patrizio’s potentials and was enthusiastic to write for Patrizio’s new release. This new fresh team (MondoBuanne Productions) has collaborated on researching more tunes of the Italian songbook, that are Patrizio’s trade mark (fans and media calling Patrizio “the Ambassador of the Italian Songbook”), but that also featured this time Patrizio´s own contemporary and timeless interpretation of International standards, alongside some stunning new compositions for an eponymous titled CD recorded this time in Hollywood’s Capitol Studios. “I’m not just a Neapolitan guy singing nostalgic songs. It’s important to give people the kind of music I am known for, but I also wanted to open myself up artistically and give them something else or rather something “more of me”. I wanted to present my passion for interpreting any great song-no matter if Italian, American or New-simply get over the grief of my fathers passing and introduce myself as PATRIZIO”. Its first release of “PATRIZIO”(2009-Warner music) in Australia, New Zealand, Asia and South Africa, responded not only with Platinum awards but with an immediate tour schedule for Austral-Asia in May 2010. On Patrizio’s birthday 2011 ‘PATRIZIO’, (Concord records) has been released in the US, and has hit number 5 on the US Jazz Billboard charts and was followed traditionally by concert tours in Australia, New Zealand, Asia, South Africa and the USA. With the music industry changing so drastically since 2008, not only many agents changed or managers lost their jobs or simple retired, but the industry turned into a “free give away industry” where music is a free gift and the artist only lives from touring, exposure and sponsorship. The long awaited nationally produced and broadcasted new PBS special in the US became an extremely difficult and unrealistic goal in today’s time. Patrizio decided therefore (being again without a manager-but his MondoBuanne Production team) not to cry over these difficulties in the US but to adapt to the new ways of handling this industry and in order to take care of his fame and popularity in other markets, to showcase now after all these years his talent and artistic credibility and started recording also in other languages. He released 2011 a special present for his South African audience-an album of great South African hits interpreted by Patrizio’s incomparable and unique voice singing in Italian, English and also Afrikaans language featuring duets with South Africa’s most popular singers called “Dankie Sued Afrika” (Universal music). While this album reaching Platinum sales in times when album sales don’t really matter anymore-Patrizio being a hard working artist already prepared his German speaking album in 2012 “Wunderbar” (Warner music GSA) where he melts in, more beautiful Italian songs and original compositions with the German and Italian language. The result of both CD’s were popular tours in South Africa and GSA along with local most popular show masters and singers. Patrizio has made a mark over the last 10 years with his modern day but yet authentic interpretation of Italian standards (not classical – not “popera”!) and has sold millions of albums worldwide – all of it mostly without a manager!! Such as Chris Botti, Adele, Celine Dion, Julio Iglesias or Tom Jones, Patrizio continues searching for that same, timeless quality in a song where the sentiments convey in a credible way and Patrizio interprets those with his own romantic and in his case natural European approach. On his fourth worldwide release “Viva la Dolce Vita” (2015 Universal Music) Patrizio still remained true to his role as an “Ambassador for Italian song”, but ‘Viva la Dolce Vita’ found the Neapolitan broadening his horizons and has put a more international slant on his natural way with a song and recorded also some more new material written especially for him. Moreover, there are spirited interpretations of Neapolitan, Sicilian and Italian standards such as “Gli occhi miei” (Help yourself) the Tom Jones hit or Charlie Chaplin’s “Smile,” in Italian – performed as you never heard before. While still in the promoting progress of “Viva la Dolce Vita” worldwide, his team of promoters and agents assured him the interest of touring not just more the US but to stop over in Australia, South Africa, Europe, Latin America and Asia as those markets have already confirmed interest for national tours in 2016 and 2017 featuring this release of the most popular songs of his first 10 years compiled in one CD named “BRAVO Patrizio”. Working now on his first Spanish speaking album for 2017.